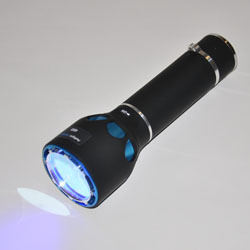 The Polilight Flare PLUS ( Flare+2 ) is a battery driven, multiple array state of the art Light Emitting Diode (LED) forensic light-source with a dedicated lithium ion battery for each band. It has been specifically designed to assist the forensic scientist to efficiently carry out an examination at the scene-of-crime. The Flare+ 2 produces powerful narrow bands of light at centre wavelengths of 365, 415, 450, 505, 530, 545, 595 and 620 nm (other wavelengths available on request). The intensity and beam profile of the output can be varied to suit the application. The beam profile (normally a 5 degree divergent beam) is varied using a set of filters giving an extra divergence of 1, 5,10, 20, 40 and 80 degrees beam cone or a line of light using the 60 x 1 degree filters. The lithium ion batteries allow the units to be used continuously at full power for 200-300minutes (depending on waveband selected) and 1440-2000 minutes on low power. The patented passive cooling system does not require fan assistance. The 415, 450, 505, 530 and 545 units are fitted with filters which remove the long wavelength tail of the output to 10-6 reduction. These filters ensure that even very weak fluorescence evidence can be clearly observed. The Flare+ 2 is waterproof and can be used down to depths of more than 10 meters (33ft) of water.